More often you hear this question regular users have… what is Cloud? The Apple iPhone and iPad users asking themself why should I place things in iCloud ? What is Dropbox and what does it do? Has it an advance for me? All questions the users have because almost all cloud service providers yell to use their service but lack to explain what the advantage would be for them. what happens with your files/applications when provider gets bankrupt ? Due to the introduction of Apple iCloud cloud computing became more familiar known by the public. Cloud services were years before the word Cloud came already in use. Companies had for many years their servers made available for their mobile users by using Citrix and/or VMWare virtual servers via external networks (early days dial-in, later internet). Nowadays cloud services are very affordable services which are not exclusively being used by companies. Some years ago I decided to supersede my home server by a NAS. I want to replace all services I was running on my server with a cloud replacement. My exception was my files I still wanted to have available locally, so I was able to access them even when internet was down. You have to think about documents, video and photos files. The advantage to migrate these services to the cloud was the utilization of my server which would free a lot of capacity (storage, bandwidth, memory and CPU). First I took care of my local running backups (do this people!) with an additional backup to the cloud. 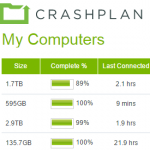 I’ve chosen for Code 42 solution CrashPlan with the unlimited plan on which I have now approx. 5.6 TB data stored as backup. (more details : feature compare). To be able on restoring short term/current files I use Dropbox and OneDrive. With my first Samsung Galaxy I’ve received 50 GB Dropbox storage for two years free. At the moment I have 11.5 GB storage without a paid subscription. On my new Galaxy I also installed dropbox so I can easy synchronize my photos and videos with my computers. In this way I have an extra backup of my photos and videos available of my smartphone. The most important file storage cloud service is at this moment OneDrive. OneDrive is also part of my Microsoft Office 365 subscription, more about this later in this article. I use Microsoft OneDrive 10 TB File Cloud Storage to save my documents and share them. I’ve used only 460 GB of the 10 TB. I save my documents always in OneDrive and let them synchronize with two of my local drives. In this way my documents are always available for me. I also use Google Drive Cloud Storage on my smartphone because it’s Google Android, but to be honest I never/hardly use it. SAAS offers the advantage that you can use software from the cloud without having the need for own servers. After I moved my backup and files to the cloud I deprecate my Microsoft server software Small Business Server 2008. To maintain and keep up with the security by regularly maintenace (minimum 1x week) is too time consuming. I didn’t want to lose free time on this. When a server experience downtime due to hardware failure or a power outage it consumes time to get it again up and running. Choosing Microsoft Exchange Online I was able to get the same functions while I had SBS 2008 while now Microsoft is doing maintenance tasks. A crash of my Exchange server would imply that I have to take actions so other users are not experience the impact of the crash and have to wait for email working again. Now the connections are not to my server on my internet connection so whenever my connection or server is failing the email users are not affected. In this way the stress is relieved. Love it. I’m a vivid user of Microsoft Office. I use Outlook most frequent but also of course Word, Excel and PowerPoint. Instead of buying every new boxed version of Office I decided last year to subscribe to Office 365. As an Office 365 Home subscriber you are entitled to share your subscription with 4 other persons which are also able to install one Office on their Windows PC or Mac and five installs of Microsoft Office on their Apple iPhone/iPad or Android tablet/smartphone. This for only 99 euro a year! I’m always being a big supporter to legal software (check out about Office 365 in my earlier written article: free does not exist). Since Microsoft announced OneNote in Office 2003 I’m using it. You are able to maintain very easy your notes. Using the latest version you are able to synchronize with a lot of devices via the cloud. Microsoft announced that on 29 july 2015 Windows 10 will arive to our PCs and tablets. I love Windows 8.1 as it is a great OS. I use it on my computers and tablet. The integration of OneDrive, Office and touch is amazing. People who don’t use a tablet with touch cannot appreciate the new interface. On my own experience I like it a lot and it’s very user friendly. Well done Microsoft. With the coming Windows 10 Microsoft will make it even a better experience. I’m sure!